The dive site Outer Castle or Castle Blinder is an offshore rocky reef in the Castle Rocks restricted zone on the False Bay coast of the Cape Peninsula, near Cape Town in the Western Cape province of South Africa. 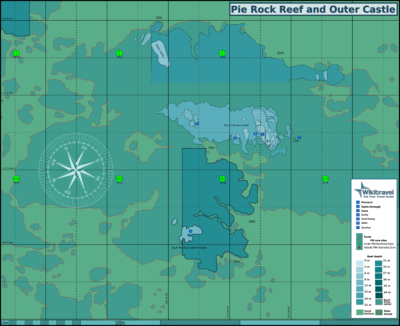 Map of the dive sites Outer Castle and Pie Rock Reef. Outer Castle is to the north. This site is in a Marine Protected Area (2004). A permit is required. The site is entirely inside the Castle Rocks Restricted Zone. Maximum depth is 22m. The top of the rock is visible from the surface on a good day. Visibility will follow the general trend of the nearby sites, but due to the distance offshore and depth may differ slightly from the inshore sites around Castle Rocks. In general it may be slightly better than the inshore sites as the influence of swell will be less. The main feature of the site is a huge granite boulder on a rock base standing on four points with a swim-through gap underneath. There is a small air cave at about 9m depth on the west side, known as Anton's oven. This is easy to find as it is marked by a deep groove in the west side of the rock which extends from about 7m deep right down and under the rock. The air cave is a part of this groove. The boulder is about 40m long on a north-south axis and 15m wide. The maximum width is at 6 to 9 metres in most places and below that is overhang to a greater or lesser extent, which eventually curves right under the rock into the swimthrough area. Above the 6 to 9m range, the upprt part of the rock curves away to the top, which is probably about 3m deep at low tide, but is usually in an area of extreme surge or white water. A short distance to the north there are a few large boulders reaching up to just above 12m, and a short way beyond them, the reef borders on sand at a depth of about 18m. The reef perimeter to the north runs roughly east-west. and the next reef system to the north is quite along distance away. To the south, the reef is contiguous with Pie Rock reef, which starts about 50m away, and extends for a few hundred metres to the south and east. Directly to the east of Outer Castle the reef is relatively low, with a few odd boulders and outcrops reaching up to 12m, and to the west the reef is more or less continuous all the way to the Castle Rocks point, interrupted by moderate sized sand patches and sandy bottomed gullies, depending on exactly which route is taken. Geology: Granite corestone of the Pre-Cambrian Peninsula pluton. The site is diveable if there is no break on the reef, andin many cases even if there is. It is moderately protected from south westerly swell. South east chop may make it unpleasant on the surface, but it may be quiet below the wave base, however a strong south easter or one that blows for a long time will push up a swell that will make it unpleasant all the way down. A long low south westerly swell may produce surge and a small break over the top, but may be otherwise quite pleasant conditions. Generally considered a winter dive site but there are also occasional opportunities at other times. Generally considered a boat dive. It is about 1.9km from Miller’s Point slipway. It can also be dived from shore entry at Castle Rocks, but this requires a 600m swim each way. Use a SMB as boat traffic in the area can be heavy on a good day. Bearing from Castle Rocks north entry approximately 027° magnetic. Easiest to find with GPS, but if the tide is low the waves may be seen to pick up and occasionally break. If there is a prominent break the site may not be pleasant to dive, and may be dangerous. The top of the rock is heavily colonised by the Red bait ascidian, and some kelp. Below the line of maximum width, a larger variety of invertebrates may be seen. The rock and surrounding reefs harbour a varied benthic ecology, and a variety of fish may be seen. The site is in the Castle Rocks Restricted Area, which is the best region of the Cape Peninsula and False Bay for observing fish, though poaching does occur and enforcement is very sketchy at best. Swim-through under the rock, and a small air-trap overhang half way up the inshore side. Good site for macro and wide angle photography. No particular route recommended. Start deep, visit the swimthrough under the rock and the little air trap on the shoreward side at about 9m depth (do not breathe the air, it may be low on oxygen). The surrounding reefs are worth a visit if you have the time. Work your way up and around the sides of the rock. The pinnacle area is small enough to visit on a single dive, but there is a lot of surrounding reef. Offshore wind may increase in strength significantly during the dive, which can be a problem for shore dives if you need to return on the surface. This is an area where boat traffic may be heavy. No special skills required for boat dives. Ability to navigate using a compass and fitness to swim the distance are required for a shore dive. A surface marker buoy is recommended for shore dives as there is often boat traffic between the reef and shore. A compass is virtually essential for shore dives as it will be needed both to get there and find the site, and to navigate back. A light is useful for looking into small holes and when under the rock to illuminate the organisms on its surface. Nitrox will allow extended time for no-decompression dives, and would be particularly useful on a shore dive as it would allow a deeper return swim. This page was last edited on 6 May 2012, at 06:53.